I’ve been sitting on this recipe for a couple of months. It seemed a little silly to post about homemade hot dog buns around Thanksgiving… even though I made them around Thanksgiving. We swam, grilled hot dogs, and had frosty mug beer for dinner. Gotta love “fall” in Texas. March seems like fair game, though. By no means do I have time or the desire to make everything from scratch all the time but I do it when I can. It’s really interesting (and sometimes really scary) to compare the ingredient list from your recipe to the ingredient list on the package from the store. Of course, I was somewhat motivated by a pack of hot dogs that I found while digging around in the bottom of the freezer. The pack of 7 hot dogs. For a recipe for 9 hot dog buns. Why does it always work out like that? 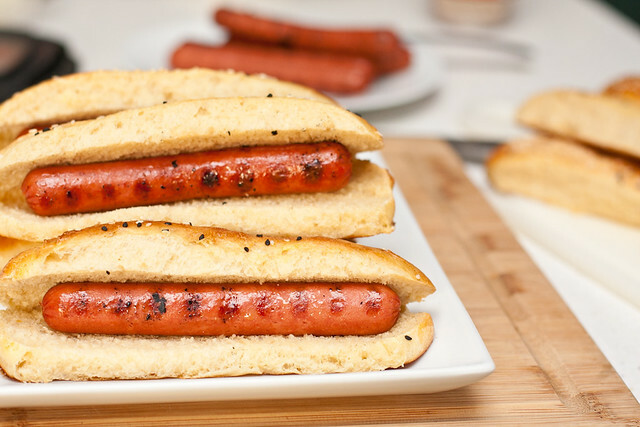 Soft homemade hot dog buns are the perfect addition to any cook-out or barbecue. In the bowl of your stand mixer, dissolve the sugar in the warm water. Sprinkle the yeast over the top and let sit for 10 minutes. Add the milk, oil, salt and 3 cups of flour to the yeast mixture. Beat with the dough hook until combined. Add flour, 1 large spoonful at a time, until the dough pulls away from the sides of the bowl. Knead 5-7 minutes, until you have a smooth, elastic dough. Put the dough into an oiled bowl, turning to coat. Cover and let rise until doubled, about one hour. Turn the dough out onto a lightly oiled work surface. Use your kitchen scale and divide into 9 equal pieces. Shape each piece into a ball. Roll the balls into cylinders, 4 1/2-inches in length and flatten slightly. Place each bun on a line baking sheet with the sides just barely touching. Cover with a light towel and let rise until almost doubled, about 45 minutes. 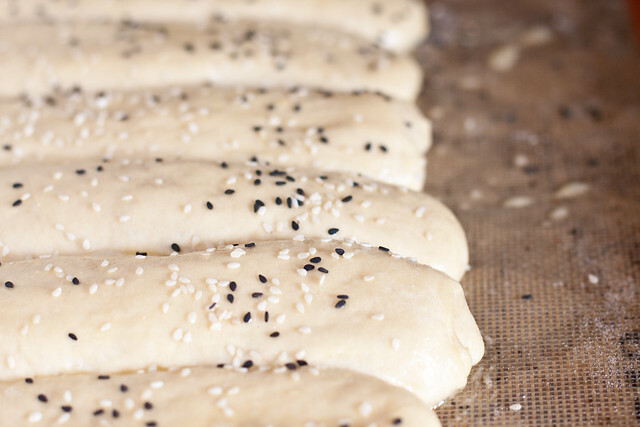 Just before baking, lightly brush the tops of the buns with the egg wash (1 egg beaten with 1 Tbsp water) and sprinkle with sesame seeds (if using). Bake for ~20 minutes or until golden brown. Transfer the buns from the pan to a wire rack to cool completely. Oh my goodness, I LOVE this post and cannot wait to make these!! Thank you! I cannot wait to try these. They look delicious, just in time for baseball season to begin. YAY SHAWNDA! YAAAAAAAYY! I have wanted to make my own hot dog buns but never got around to trying it or even looking for a recipe. And I’ve been craving hot dogs a lot, so this is even more perfect. Oh boy, I’m excited!!!! Could this recipe be used for hamburger buns? @Ali, Haha, yes! I’ve seen it! And the original recipe was a hot dog & hamburger bun recipe so you could absolutely use it for burgers. What a great idea! I would’ve never thought to make homemade hot dog buns. This recipe is perfect for this warm weather! 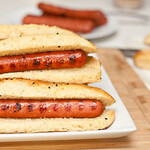 Ok, obviously it can be done, but I never even THOUGHT about making hot dog buns before! These look SO much better than store-bought ones! Homemade hot dog buns – why not, right? They look awesome, and I’m totally trying these in the next few weeks! This is such a fun and healthy idea! They look so delish. Good for you trying something outside of your comfort zone! I’ll have to try these for myself some day. These buns look great — and I bet they beat any store-bought packages any day. What a fun twist on a traditional BBQ. How did they taste? Worth the extra effort? Ha – I did this once too but with mixed (err, bad) results. They were leaden, but I probably didn’t have an exact recipe. As it was also formed out of desperation at least I have this recipe to bookmark for future extreme cases. So thanks! This is an AWESOME recipe – I just made them this morning, they turned out perfect. I have never made a recipe for hot dog/hamburger buns that was this nice and light, crusty on the outside and super soft on the inside. I’m going to use this for all my buns! I used bread flour and instant yeast (slightly less, 2tsp) and I just can’t rave enough. High five. Never mind I figured it , I’m new at making everything from scratch I don’t buy anything that’s in a bag or box nomore. I’m just a beginner bread dummy right now lol! Can you use this recipe to make hamburger buns? Any idea on making ahead and freezing? Bake, cool, and package in a gallon freezer bag – separate with a sheet of wax paper if you have room in the bag to stack them. Making these as we speak. Can’t wait to roll them and bake them.